The 2017 BMW 230i xDrive Convertible has a similar place in the BMW lineup to that of the Audi A3 Cabriolet in its model line. This is where BMW all-wheel drive convertibles start. Indeed, shoppers in this part of the market should consider both of these ragtops. They are similar in size, accommodations and price. Both will seat four. The 230i xDrive Convertible is powered by a 248-hp turbocharged four-cylinder engine (28 hp more than the A3), coupled to an 8-speed Sport Automatic transmission with paddle shifters. The xDrive all-wheel-drive system sends power to all four wheels. Standard exterior equipment includes 17” alloy wheels with run-flat tires, halogen headlights, and a black softtop. Inside, you sit firmly in the standard 8-way manual adjustable sport seats with power side bolsters, covered in SensaTec simulated leather (real leather is an option). Enjoy your tunes through the 7-speaker 205-watt audio system with Bluetooth, let the dynamic cruise control maintain your speed, and set just the right temperature with the 2-zone automatic climate control. This BMW also has something other brands do not – the BMW heritage as the Ultimate Driving Machine. 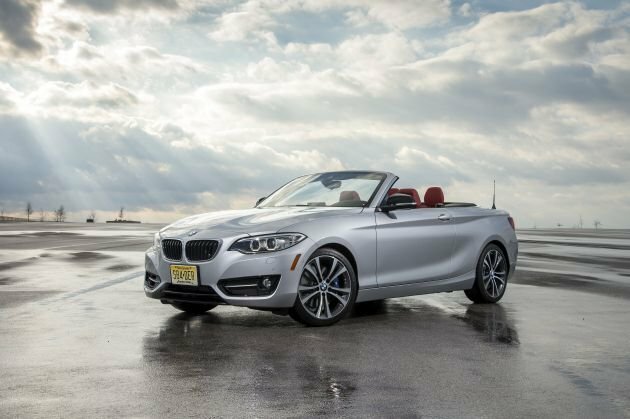 The 230i xDrive Convertible likes to be driven, and the harder the better. The BMW 2 Series has been hailed for its focus on driving dynamics in a reasonably sized and priced package. Driving enthusiasts, you will appreciate this car!